The next football world cup is all set to be held in June-July 2018 in Russia. FIFA is the most popular sports event in the world, both in terms of the number of viewers and the numbers of bets placed. The last FIFA World Cup, which was held in 2014, had a collective global audience of close to 3.2 billion people. This is a significant proof of the popularity of this game. 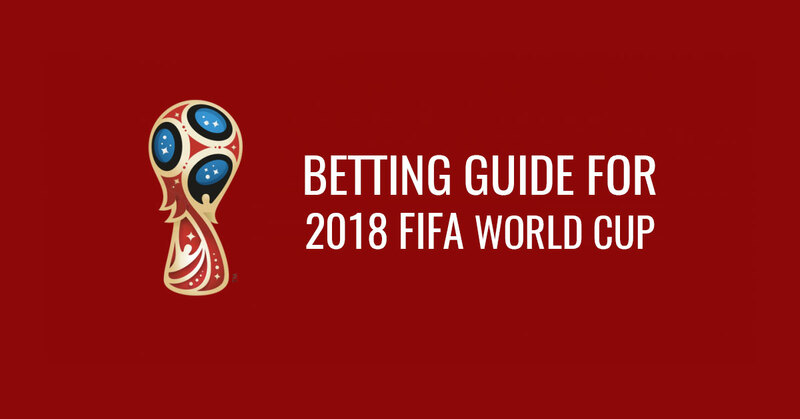 If you are planning to get involved in football betting in the upcoming world cup, here’s a guide to help you. The qualification process for the upcoming FIFA world cup took over 2 years, and 32 teams managed to enter the competition out of the participating 210 teams. The World Cup Winners market is the most popular betting market. A number of online gambling companies and some sports agents accept bets on World Cup games. Here’s how you can bet on this event. 1. Choose a bookmaker: First of all, you need to choose a reliable bookmaker or sportsbook site to get access to the best World Cup markets. Make sure to check the odds being offered by a particular website before you join them. Also, look for the websites that offer attractive bonus offers and deals to new joiners. 2. Create an account and make a deposit: Get started by creating an account on your selected online sportsbook. Do not provide any private information such as bank details, etc. at the time of registration. Contact the customer support of the particular online betting site for any kind of help. 3. Look for the best World Cup markets: Look out for the available markets for the upcoming World Cup, including the famous World Cup Winners market. Upon clicking a specific market, you will see the selections along with the offered prices. Choose a selection to start betting. 4. Make a selection: Check out all the selections and odds carefully and choose the option you want to bet on. Upon clicking the selection, it will be added to your bet slip, which is usually available on the right side of the screen. 5. Make the bet: Enter the amount you want to wager on a particular event and place the bet. All you can do now is set back and enjoy the game and hope for your selected team to win. Here are the top favourites in this competition. Germany: The current holders of the World Cup are again the most favourite team for the upcoming event. However, the odds of them picking the Cup again are not very high. The reason is the many changes made in the team since the last World Cup. Some of the most experienced players like Miroslav Klose have been replaced by new faces. Still, it won’t be fair to underestimate them, as the current team has managed to win all 10 games in the qualifiers by scoring 43 goals in total. They are obviously the betting favourites as well. Brazil: Brazil continues to retain the second spot in the top teams’ list. However, this team seems quite strong compared to what we’ve seen in the past events, and we are truly hoping to see some action from their side. The team didn’t see much success in the last FIFA World Cup despite the fact that the event was hosted in their home country. They were defeated by Germany in the Semifinals. Still, the hopes from the current team are quite high, as they managed to top the qualifying group by scoring 41 goals in their qualifier matches. France: The reason why France has been included in this list is their past game record. The France football team has been one of the strongest teams in the world. They have several Euro cups and World Cups in their name. The current team, however, doesn’t do justice to this tradition. They managed to score only 18 goals in the qualifiers and stood third in their group. Let’s see what wonders they can do in the actual tournament. Spain: Gone are the days when Spain used to be one of the most powerful football teams on the planet. With the continuous losing streak they have maintained since the last World Cup and Euro events, it won’t be harsh to say that there are not many hopes from this team. However, the team has shown a great performance in the qualifier matches by winning 9 out of 13 matches, so they are still in the line of favourites. And one should definitely not forget their historical win in the 2010 FIFA World Cup. It may be a huge mistake to undermine this team while betting. Argentina, Belgium, and England are the other teams on the list of top betting favourites in the upcoming World Cup. Most of these teams are great and did perform exceptionally well in their qualifiers, but you can never be sure about their future performances. So, be careful when making a selection for your next bet. And make sure to check out the online sportsbooks for regular FIFA betting odds.